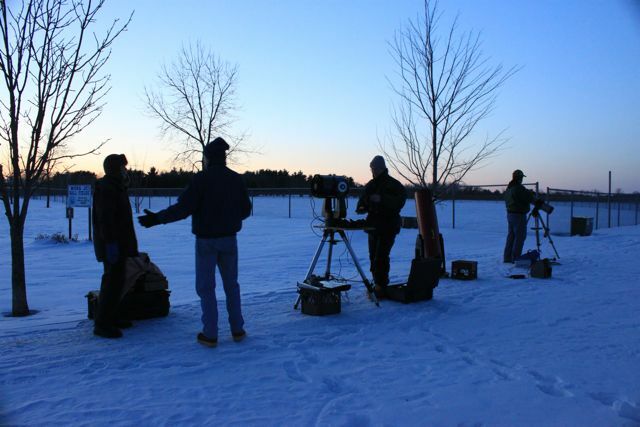 East Central Minnesota Astronomy Club: March star party yields several unexpected surprises!! March star party yields several unexpected surprises!! We just got back from a great couple hours in the snow and truly had a ball tonight. To start things off, at about 6:35 the ISS flew overhead and it was so bright and slow moving that everyone got a view of it through the 10" dob!! Very cool. The next surprise was that while we were enjoying a dusky view of Jupiter, the thinnest waxing crescent moon any of us had ever seen appeared. It was remarkable! We had 9 club members in attendance and our youngest club member completed her "Young Observers Club" program this evening. She demonstrated her knowledge of constellations, planets, the moon, stars, nebula, and open clusters by showing an example of each to us using a dob equipped with a Tel-rad. We were all proud of this six-year old's achievement! The skies were remarkably clear despite the "mostly cloudy" forecast and the temps were in the mid-teens. Conditions could not have been much better for early March, so we took the opportunity to participate in the Globe at Night Observation program determining the visual limiting brightness of the stars from our location. This exercise was both fun and educational for everyone! Come out and join us for our next club meeting Tuesday, March 22nd at 7:00 PM at Dr. Jim Williams' dental office. What a wonderful event! Glad the ECMAC is out of hibernation and forging ahead with a year full of fun activities! Well done all and congrats to all the young observers!